In January 2019, Secretary of State Michael Pompeo visited the Gulf Cooperation Council (GCC) states, as well as Egypt, Jordan, and Iraq. The trip was in part meant to quell freshly emerging uncertainties related to the United States’ engagement in the region. New doubts were most prominently raised by President Trump in December when he made a sudden announcement that the withdrawal process would begin for the 2,000 U.S. forces deployed in eastern Syria. 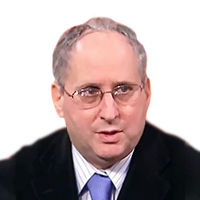 Concerns over Syria come on top of questions already having surfaced due to recent controversies among some in the region regarding the seven-decades long strategic alliance between the United States and the Kingdom of Saudi Arabia. The future of the relationship has been put into doubt amidst the fallout of the October 2018 killing of Saudi journalist Jamal Khashoggi at the Saudi consulate in Istanbul. The Khashoggi saga compounded uncertainty surrounding the U.S.-Saudi relationship that had already been rising due to the U.S.’s declining need for crude oil imports. Some in the region remain nervous that American energy independence could lessen the strategic value of the region to the United States. The third circumstance contributing to the uncertainty that necessitated Pompeo’s trip relates to the slow-motion dissolution of the GCC, once a fundamental pillar to the United States’ security in the region. With this context in mind, the Pompeo trip was intended to relieve widespread regional fears, rebuild some kind of Gulf consensus, and demonstrate that the Trump Administration is committed to the level of direct American involvement in the region that it is required in order to achieve its primary goal of sequestering Iran’s regional influence. However, in spite of this supposed common enemy, Pompeo’s trip did little to put to rest the concerns that initiated his visit in the first place. At the outset of the trip, Secretary Pompeo’s speech in Cairo articulated a clear message that the United States would remain fully engaged in the region, despite a U.S. withdrawal from Syria. In particular, Pompeo singled out a desire to counter Iran’s influence as a primary reason to maintain a presence in the Middle East. 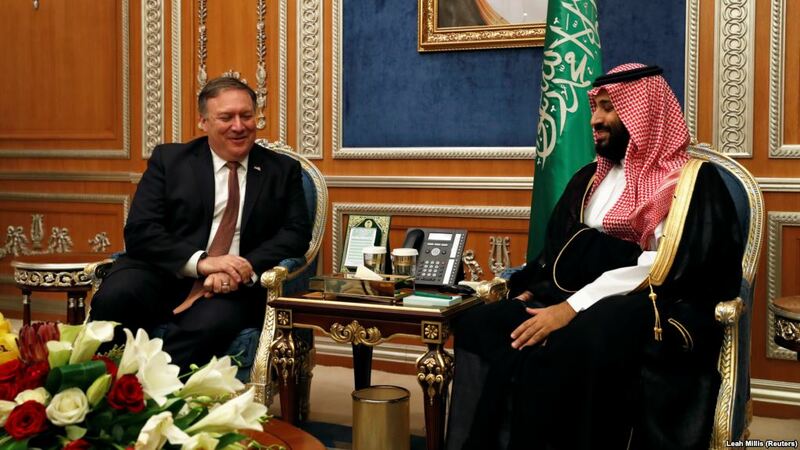 While on the Saudi portion of the visit, Secretary Pompeo met with Crown Prince Mohammad bin Salman in spite of the widespread American criticism directed toward the Saudi ruler and the Administration’s engagement in light of the Khashoggi scandal. While Pompeo insisted that any Saudi investigation of the Khashoggi killing should be thorough and lead to culpable officials being held fully accountable, the meeting sent a clear signal to the region that the Administration is committed to maintaining the longstanding U.S. partnership with Saudi Arabia in spite of the scandal. At each stop during the trip, including in Saudi Arabia, the Secretary stressed the need to resolve the ongoing Saudi and Emirati-led isolation of Qatar. The rift has nearly necessitated that Qatar, as well as Kuwait and Oman, improve relations with Iran, rather than take the steps required to counter the Islamic Republic. The schism has also hindered U.S. efforts to organize the “Middle East Strategic Alliance” (MESA), consisting of the GCC states plus Egypt and Jordan that presumably would serve as the United States’ local proxy in containing Iranian power. To stress the Administration’s focus on the Iranian priority, as he embarked on the regional visit Secretary Pompeo announced the United States would organize a February ministerial meeting in Poland in February tasked with strategizing as how best to counter Iran’s destabilizing regional activities. Other aspects of the administration’s central message were reinforced by Pompeo throughout the trip. 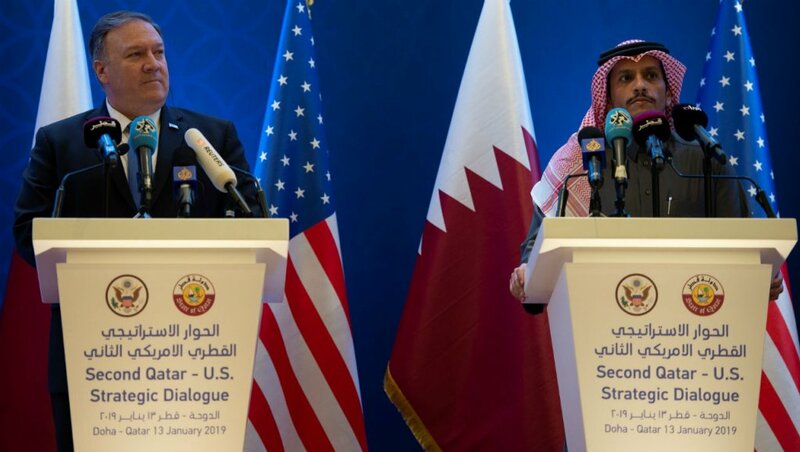 In Qatar, the Secretary convened the second U.S.-Qatar Strategic Dialogue and signed an agreement for further expansion of the pivotal Al Udeid Air Base there. These understandings, coupled with the praise lavished on Qatar by Pompeo, were intended to stress to Saudi Arabia and the UAE that the United States does not support their insistence on the continued isolation of Qatar. During the trip Secretary Pompeo was also expected to convene another U.S.-Kuwait Strategic Dialogue session, however the Kuwaiti portion of this trip was cut-short due to a death in Pompeo’s family. Throughout his visit, particularly in Saudi Arabia, UAE, and Oman, the Secretary urged the Saudi-led coalition battling the Iran-backed Houthis in Yemen to de-escalate the conflict and support U.N. efforts to broker a political solution. This discussion point reinforced the historic U.S. commitment to regional conflict resolution, while at the same time resonated with U.S. criticism of the Saudi Crown Prince. Despite the extensive publicity surrounding the Pompeo visit, the trip did not evidence breakthroughs on any of the region’s core dilemmas, nor made any indication that the concerns over the administration’s Middle East strategy had been resolved. Through the trip, the Administration’s specifics as to how rapidly and under what conditions (if any) the Syria withdraw would occur routinely shifted. The Secretary did not settle the question concerning the fate of the allied Syrian Democratic Forces in Syria amid Turkey’s continued threats to move against the Kurd-dominated forces after the departure of U.S. troops. The Gulf states have not indicated any inclination to provide troops to potentially take over the ground-force role of U.S. forces in Syria. In fact, as the trip unfolded, the UAE and Bahrain reopened their embassies in Damascus, suggesting that several Gulf states are already adjusting their policies to a reduced US role on the Syria issue. No progress toward resolving the intra-GCC rift appears to have resulted from Pompeo’s meetings. Neither does the establishment of MESA appear imminent amid the continuing divisions among the GCC states, Egypt, and Jordan over the degree to which they view Iran as an urgent threat. The announced ministerial meeting in Poland did not appear to attract broad international support, insofar as U.S. allies in Europe and other parties to the 2015 nuclear deal continue seeking options to preserve the agreement without U.S. participation – even if doing so risks triggering some secondary U.S sanctions. Yet, the attention given to the trip by U.S. officials probably alleviated at least some regional concerns that the Trump Administration seeks to disengage from the region by ceding all influence to other outside powers, particularly Russia or China.